Wide double-layer comfort grip and balanced gripping axis reduce writing stress. 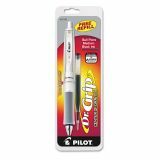 Pilot Dr. 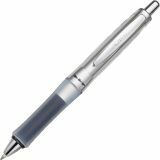 Grip Center of Gravity Retractable Ballpoint Pen, 1mm, Black Ink, SR/GY Brl - Retractable ballpoint pen is designed with perfect weight distribution for comfortable, balanced writing. Geometrically contoured, wide double-layer grip reduces writing stress and alleviates hand fatigue. Ink is extra long-lasting and provides an ultra-smooth writing experience. Center of Gravity Retractable Ballpoint Pen is commended for Ease of Use by the Arthritis Foundation. Retractable design protects pockets and purses. Refillable ballpoint Pen writes in black ink with a medium point. Silver-toned barrel with colored grip and metal accents.